This summer I've been doing a lot of beer cocktails at BBQs and pool parties. Malbec has been having us over almost every Sunday for some grilling action and lazing in the pool, and while I love my Lush Chef Taste Testers, I can't be busting out the expensive stuff all the time. Beer cocktails can go a long way and won't break the bank, so they're perfect for large, casual gatherings. Last BBQ we went spicy and had Micheladas, but this time I was craving something fruity. I bought a huge box of raspberries at the farmers market and went home to get a little blender happy. 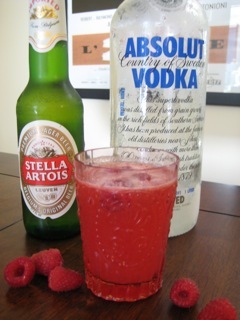 - Add 1 cup raspberries, lemon juice and vodka in blender and purée. - Transfer to a pitcher, add the beer and stir. - Serve each cocktail with some raspberries for garnish. Thank you for posting this drink recipe. My husband loves beer and I love mixed drinks. Great combo for us!